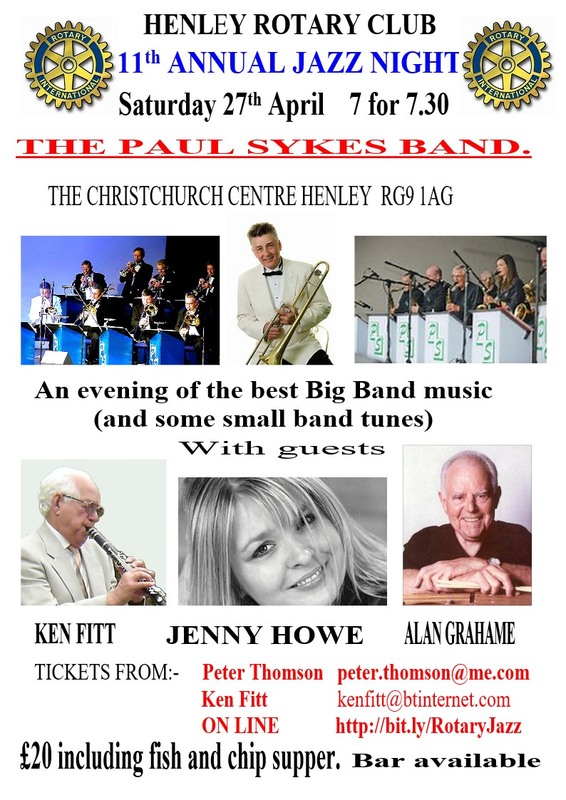 I have the the poster attachment giving details of an annual Rotary Club Jazz Gig at Henley on April 27th which falls on the Saturday following our April session. Looking at the poster it seems Ken Fitt, our summer guest, is down to play that evening and apart from this the evening line up should be very pleasant. Maybe, if enough of us wish to attend we could arrange car share travel to Henley for the evening. If anyone has news about local jazz groups or gigs around the area let us know and we will publicise them here. At our January meeting members decided that we have enough interest and material to establish monthly meetings for our group. Presently, we are deciding if we will alternate our meetings between the James figg and Six Bells as both pubs have been very accommodating to us with the Six Bell giving us winter warmth and the James Figg greater space. Refreshment purchase at the James Figg bar will be appreciated. The next meeting is being held at the James Figg on Wednesday 24th April after a period of absence since last November. The usual format prevails with a start time of 5:00 pm and nominal finish at 7:00 pm followed by the optional Fish & Chip supper. Anyone wishing to eat something different can place an order directly at the bar for serving at 7:00 pm alongside the supper orders. While it was nice a cosy at the Six Bells during the winter months the James Figs Stables gives more leg room and hopefully more members will be attending. We have 30 plus members registered to our group of which a core number of 16 to 17 are regulars at most meetings and we are lucky in having some who are both knowledgeable and entertaining bringing with them contributions for the evening. If you are a member who has not attended recently then you are missing a treat. Please be aware one does not have to stay or attend for the entire evening nor book for the optional Fish and Chip supper after our session. Just turn up and Enjoy some Jazz. Moreover, we are now hoping to enhance our enjoyment for this and future meeting by adding some video presentations mainly by way of uTube connections being made available through the James Figg Internet connection and some DVDs. Over and above this innovation we are now the recipient of higher specification audio amplification found lurking in the loft of Mike Price. Apparently, this is GTU3A owned equipment and only came to light when I enquired about the U3A purchasing a system for our and any other music groups use. With the Boom Box for mono vinyl on the record deck we should have plenty of sound. That is enough of the promises and technicalities what you want to know is the suggested theme for our next evening. One of our members suggested The Blues but some may question if The Blues is jazz and, anyway, we may be having enough Blues with Brexit (hush my mouth), so I though it might be more appropriate to consider the influence of Blues in Jazz. As always this is not absolute for the entire evening so if you have got something you want to share whatever it is bring it along. By the way did you see or miss the Friday evening BBC4 programme about Lonnie Donnigan and Skiffle of the 1950s? If you missed it then it is worth taking a look on iPlayer, [Rock Island Line - The Song That Made Britain Rock Friday 12th]. iI is a good story about the interplay on Skiffle and Jazz and the developing use of the Guitar which went on to dominate the era of Rock and Roll. Lots of early British jazz personalities you will know and love? Members of nearby U3As are very welcome to join us.